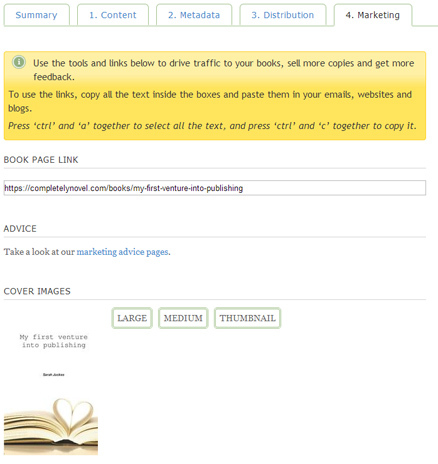 How to self-publish your book on CompletelyNovel Then refresh the current page you are. 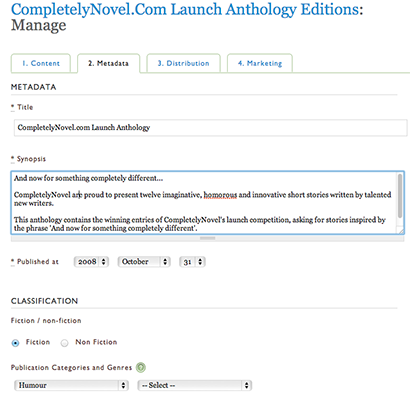 The team behind CompletelyNovel have simplified the publishing process, so that you can achieve professional results for your book for a low price. We offer a painless publishing process, which doesn’t require you to have specialist design or technical skills. 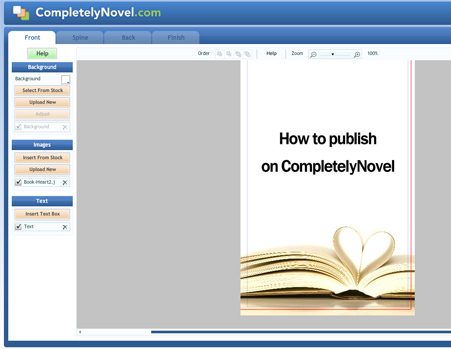 You don’t need to download any software or pay upfront to start publishing on CompletelyNovel. Due to our unique subscription model, authors earn more publishing on CompletelyNovel. 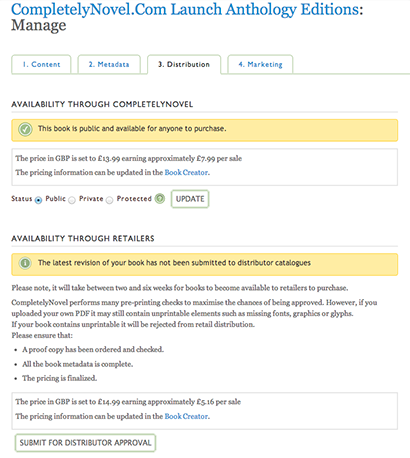 On this page we offer a step by step guide to the CompletelyNovel print-on-demand publishing process, so that you can decide if it is right for you. 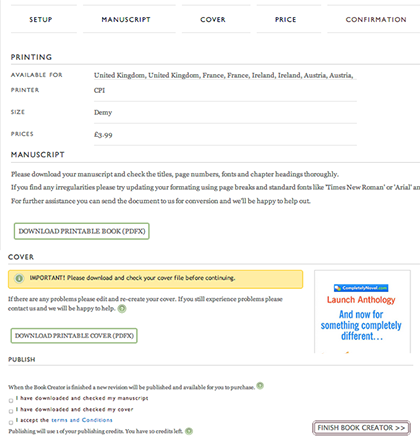 If you’d like to know more about publishing an eBook on CompletelyNovel, please see our CN eBook advice page. Decide which publishing plan you would like to choose. Not sure which plan is for you? Take our quiz. 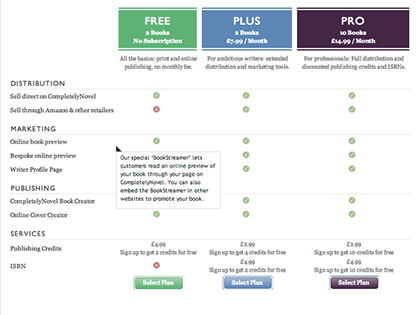 As well as offering a Free Plan, you can select from our Publishing Plus or Publishing Pro Plans. If you change your mind later, you can switch plans at any time without a problem. 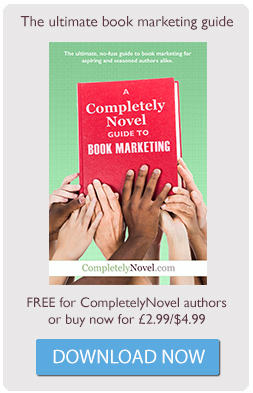 You can find out more about how you can earn more money on CompletelyNovel, on our price comparison page. You can start creating books from your Portfolio. You can find this by clicking on the Home tab. If you already have books on CompletelyNovel, you’ll see a list of them here. 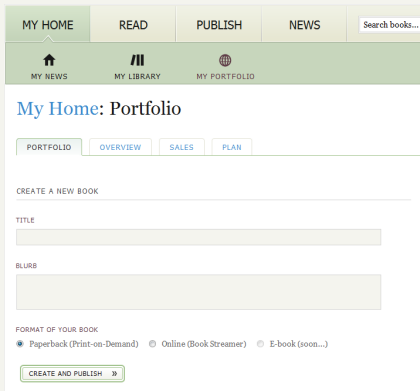 If not, click ‘Create a Book’ and fill in the boxes with your title and blurb, then click to ‘Create and Publish’. Start by choosing which size you would like your book to be. 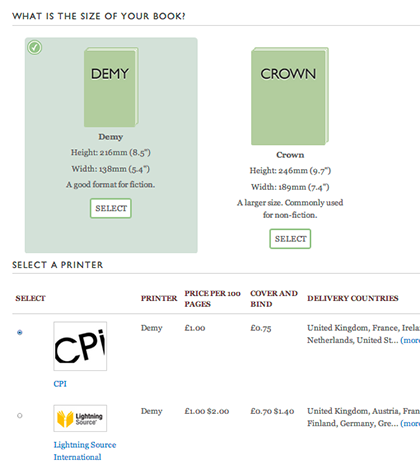 We recommend Demy for fiction, and Crown for non-fiction. Then, select the right printer for you. Both our printers offer very high quality books at the same price, but you might want to look at where they deliver to decide which one is for you. Now it’s time to upload your manuscript. You can upload it as a Word document or a PDF and we will make sure that it is print-ready. Want to know how to set up your book? 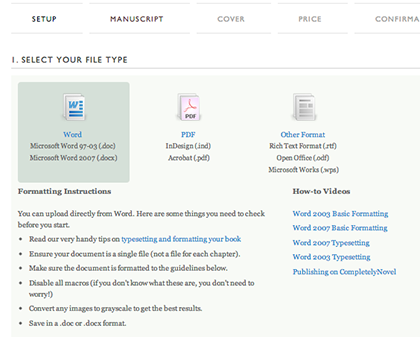 See our advice on formatting and typesetting, or we offer services to help you, if needed. 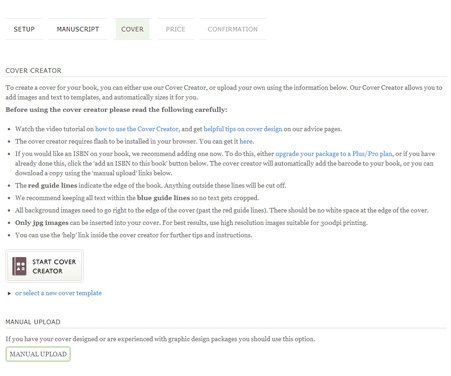 We make it easy to make your cover using our online Cover Creator. If you prefer, you can upload your own PDF, and we offer full instructions for your designer if you’d like to do it this way. We offer advice on how to make your cover look professional in our advice hub. You can add images and text into the Cover Creator and drag them around to create the cover that you want. You can design the front, spine and back and we will make sure that it is the right size and format for the printers. 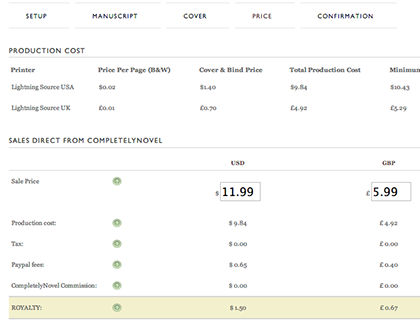 On CompletelyNovel you get to decide the price of your book. You also get to keep the whole royalty (the difference between the sale price and the cost to produce the book). Our handy calculator will help you work out what you will earn from each book at different retail prices. You then have the chance to check through your manuscript, cover and book information to make sure that it looks the way you want it to. When you are happy, click ‘Publish’. Once you have created your book, you have the opportunity to use a host of tools on CompletelyNovel to manage its distribution, promotion and sales. You can monitor the book’s performance, make changes to its bibliographic data and amend things later if you need to. Here is a quick tour of the book management section. You can alter and update the bibliographic information from the book’s individual ‘Manage’ page. More information on metadata. Ensure your book is up to scratch by buying proof copies at cost price to read through. You can also buy copies to share with others who are going to preview it before you make it public. Ready to send your book out into the world? We’ll let you keep it private until you’re ready. Then you can push it out onto CompletelyNovel own platform and other retailers. You can find out more about CompletelyNovel’s book distribution channels, here. We believe in empowering authors to market books smartly and successfully, so we give you a range of tools to do this. Take advantage of access to embed codes, links and advice to promote your book across the web. You can also find loads of information on ways to promote your book on our advice pages. Want to have a look at how other people are doing it? Take a look at the books being published by other authors on CompletelyNovel. If you have any questions, just let us know by filling in the Contact Us form.